The ideal environment for learning – and leading the way. GAUSS provides students and researchers with the high-end analytical tools needed to solve the complex problems they’ll face in both academic and professional careers. Unlimited Campus Site License: No Hassle-Easy to Implement-One Low Annual Fee! Fast and Efficient: GAUSS has many advantages for computational econometrics. At its core, GAUSS is a fast and efficient matrix language. The GAUSS matrix language allows for a very natural translation from the mathematical equations in a journal article or textbook to a program that you can run on your laptop, or a large cluster computer. This results in efficiency and speed in developing algorithms, customizing and implementing new code or running large data sets. 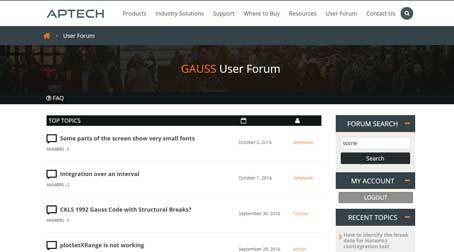 Interactive: The highly interactive user interface of GAUSS provides a fully-featured environment with top of the line graphics. This makes it easy to interact with data and models and provides immediate feedback along every step of algorithm development. Advanced Tools: GAUSS includes many innovative tools to aid in the creation and understanding of your GAUSS programs and the mathematics that they represent. Examples include: Interactive graphics editing — Step through your program line-by-line while viewing the changes to your data— Automatic or manual threading for precise resource utilization in cluster, cloud and production applications — And too many others to mention. GAUSS has the tools to facilitate your work and make you more productive. Intuitive: The matrix based programming language maps directly and intuitively to logic and theory. This, combined with powerful smart editor features, makes transforming classroom theories into computations straightforward and easy to learn. Customizable: GAUSS has the flexibility to customize models to solve a broader range of problems. This provides the opportunity for Students to extend theoretical knowledge to real-world problem solving, empowering Students to work in a wide variety of positions and offer more value to future employers. GAUSS Applications are a complete suite of in-house pre-programmed and modifiable procedures to help users quickly tackle all of their computational needs in various fields of study and industry, including Statistics, Econometrics, Machine Learning / Statistical Learning, and more. Check out our latest manuals and tutorials and white papers. In addition to our new GAUSS in the Classroom license, Aptech offers an array of license types to meet the unique needs of its academic customers at a price that works for any budget. Significant academic discounts are available to students and employees at approved educational institutions.